We have hit the new growing season running! Team members getting expert line marking training. Staff training. We take it very seriously. Carty Services’ employees love their jobs and learn a lot on the go, but, we’re growing like the tenacious bindweed (now up to 15 employees at the height of the summer) and the more experienced staff are finding the time they have to pass on their skills is increasingly at a premium. To plug the gap formal training is becoming increasingly important. Plant, pest and disease recognition is something which runs through all our training sessions not just so we can do our jobs effectively, but also of course, so we can effectively advise our customers. Techniques for use of tools and equipment are taught in sessions so we can carry out our tasks safely and efficiently. 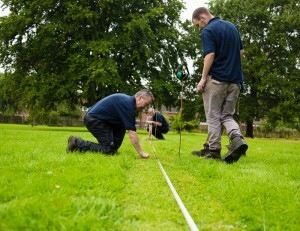 Whether pruning, mowing, strimming or hoeing, we need up to date knowledge. Sports pitch management – A relatively new angle for us, this involves both lawn care and line marking. Investing in training has led to a big increase in our work in this area. Inspiration & encouragement – Our employees love the natural world and this year we are taking them to an historic garden to see what the team can learn from the management and maintenance of a top flight garden. Health & safety awareness is taught across the team, initially away from the usual workplace. The increasing numbers of employees need a greater number of first aiders. Most long term staff were trained as Level 2 First Aiders at the end of the winter. Team building – Training also gives an opportunity for established and newer employees to meet. With roles becoming increasingly specialised, we also get to experience what our colleagues do and can build an appreciation of their work. And who knows, a taste of what others do can lead to a keenness to develop a role in this area in the future. These regular sessions, together with homework (for example, a list of plant idents) that gets checked at the following session, reinforce our learning and ensures it stays fresh in our minds. We are realistic – people come and people go. To keep costs down we employ on enthusiasm rather than knowledge, so we know we have to train. If successful, we are hoping these regular training sessions will rotate in a bi-annual loop, so that new starters can join at any point. We may be a small company, but staff development is a big deal at Carty Services.